Hiking the Inca Trail has become more and more popular each year. This hike is extremely regulated by the Peruvian government who limits the amount of people who can enter the trail each day by a permit process. These permits have sold out QUICKER than ever. All of April, May and June were sold out by New Years. But right now there is a unique opportunity to still hike to this World Wonder if you are hoping to come in April. 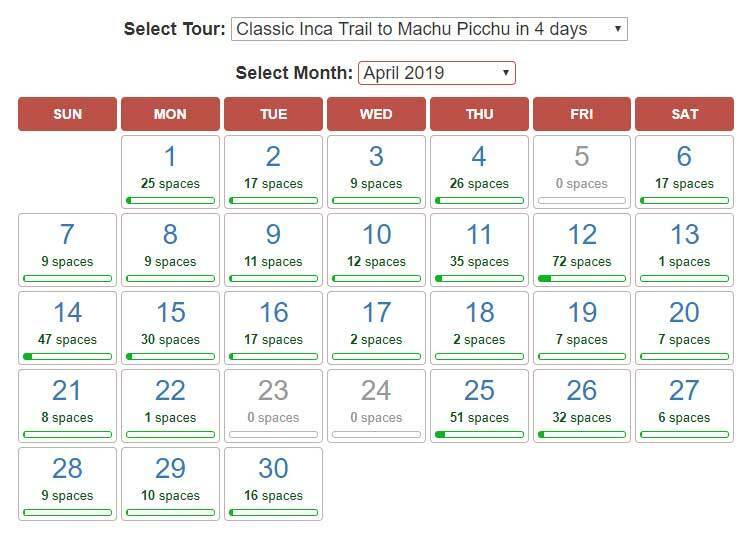 The government has released permits from companies who did not pay for their reservations (just another reason to make sure you sign up with a responsible tour operator like Inka Trail Expeditions Perú). The below calendar shows availability of permits left at this very moment. You only need a permit to START the trek. If you are interested and see a date that works, contact us immediately. And if you are hoping to hike in May or June, we may have some good news in the next few days.